Sep 04 2014: We Finally Get Our Bikes! We had heard horror stories about shipping out of Peru, and we were prepared for the worst. 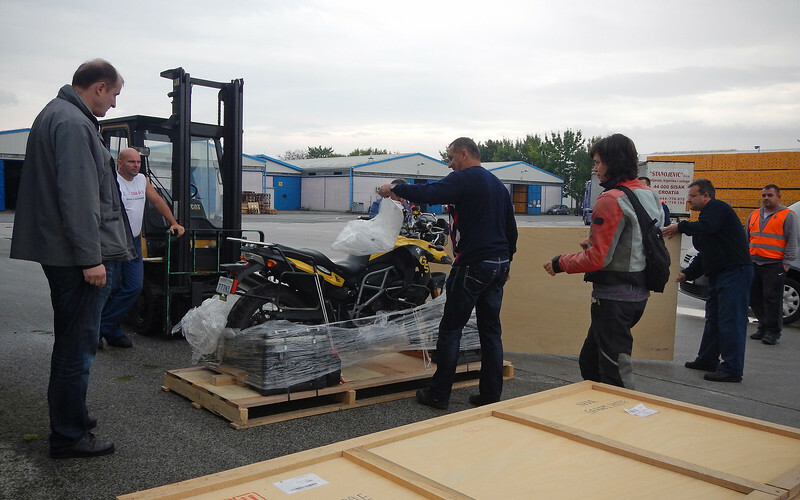 Right now, the biggest headache was trying to convince the customs people to release our bikes to us. There was a lot of finger-pointing and ball-dropping between the Croatian Customs and the local shipping agent. We found out that the bikes have actually been in storage for the last three weeks with nobody looking at the paperwork! 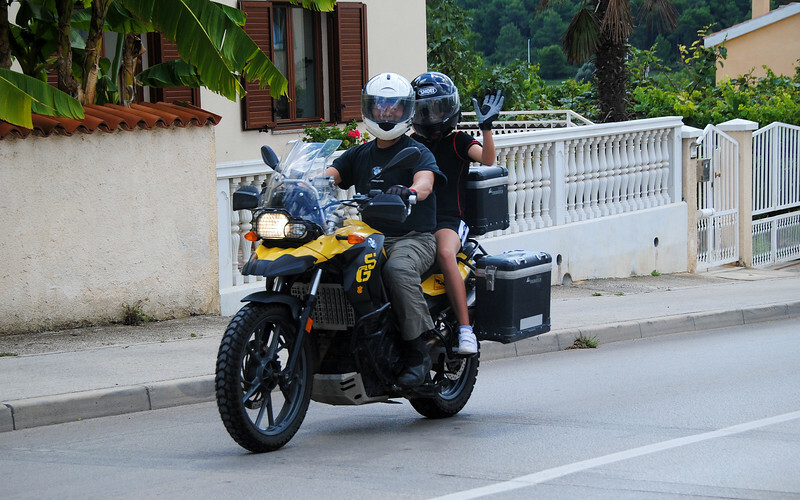 In the end, we got the bikes released by going through the official Croatian channel - namely by knowing someone. Neda's cousin, Iva, works for an insurance company and she made a few phone calls and got our bikes out of Bureaucracy-Jail! Hallelujah i hvala Iva! While we were visiting her, she told us that all the administration in Croatia is in a bit of a frazzle because of their recent entry into the European Union. All the paperwork surrounding insurance and importation has all changed and has to conform to EU standards. But she said this will be nothing compared to when the country adopts the Euro as their official currency! Neda: Did you remember to disconnect the batteries before the shippers crated our bikes? Our batteries will be dead. No doubt about it. We came prepared for this by buying one of those portable jump-start lithium batteries. 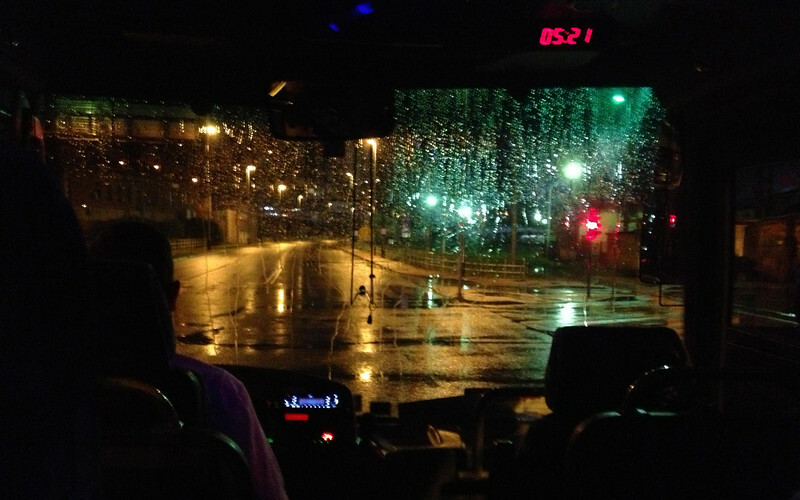 We also gave ourselves lots of time, taking the 4:45AM bus from Pula to Zagreb. After 3 1/2 hours of bleary-eyed, rainy roads, we arrived at the shipping warehouse bright and early for the grand unwrapping. With a crowd of intensely curious warehouse guys all gathered around our bikes, I turned the key on my bike and... nothing. No lights on the dash, no clicking of the starter solenoid. The battery was completely flat as expected. Our audience shook their heads like doctors coming out of an unsuccessful operation. I was starting to get a bit annoyed with our audience. Didn't they have jobs to do? Neda said this was the Croatian way: one guy doing all the work and five other guys standing around watching. Truthfully, I was pissed that my jumpstart didn't work. The warehouse guys were actually very friendly. I knew what the problem was. The battery wouldn't hold a charge. The electrolyte had completely boiled away on the journey over. No amount of jumpstarting would fix this, only a refill or a new battery would do the trick. We had the same problem coming back to Guatemala last year, and now dumbass that I am, I do the same thing again. I was very angry with myself. The battery guy filling up our new batteries with electrolyte. How long will these last? We called around trying to find a place that carried the gel batteries that our bikes used. Thankfully we found one right around the corner from the warehouse. But the place only had one Yuasa left, the kind the factory installs on the bike. They also carried a cheaper Italian brand that was compatible, but we heard that those don't last very long. So we bought one anyway and put it in Neda's bike. This should make an interesting future blog entry. With everything hooked up, I fire up both bikes successfully. That elicited a huge cheer from the warehouse guys. We pulled out of the parking lot like superheroes, despite the cats and dogs that were falling from the sky on our helmets. We didn't care! After a two and a half months off two wheels, we were finally riding our motorcycles. And in Europe! Third continent this trip! WAHOOOOO! It was actually kind of fitting that the raincloud that had been following us since September 2013 in Guatemala joined us here in Croatia. It's like that acquaintance that you can't stand but always hangs out with your group of friends. You just kinda get used to him. Hanging out with our constant companion - the rain. We didn't spend too much time in Zagreb. Neda's sister and her family were only in Pula for this week and Neda wanted to spend as much time with them before they returned to Italy. 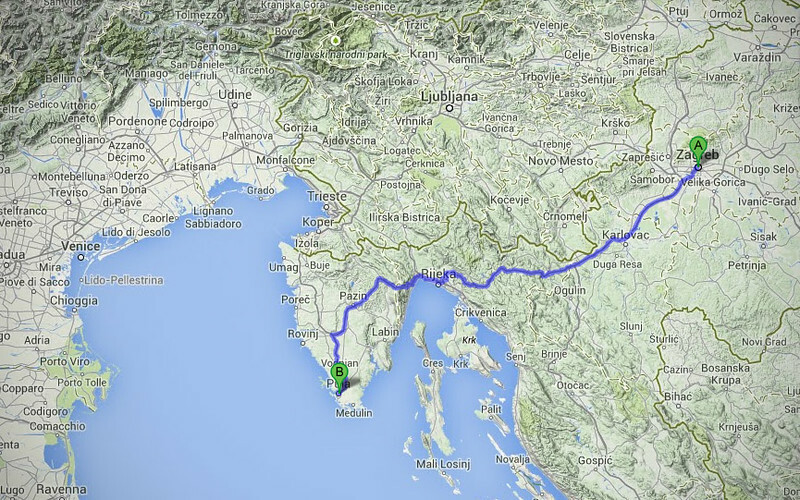 So we hopped on the highway and headed back to Pula in the afternoon. As we got off the toll road, I looked at the bill we racked up... as expensive as the Cuota highways in Mexico. Muy caro! Good thing we're planning to avoid highways in Europe. Looking forward to having a much different trip than our all-Autostrada experience the last time we were here. As we neared Pula, Neda told me over the communicator that it was such a strange feeling being in her hometown on motorcycles. When she left Croatia, she didn't even have a driver's license. Tea was whooping with joy the entire ride. I think we've created a future motorcycle rider. We dropped by one day to visit Goga and her family, and with her parent's permission, I gave Tea a ride around the block and back. At first she was a bit cautious, hanging on to me with eight limbs like an octopus as we set off, but by the time we got back, she had both arms in the air like she was flying. It reminded me of the first time I ever rode a motorcycle, and how free that feeling was. Exactly why we are doing this trip the way we are! 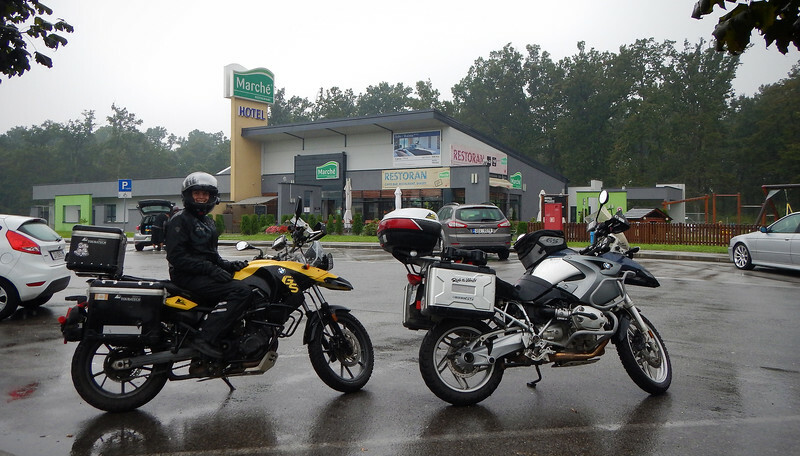 We're in Europe and we have motorcycles. Time to put the Ride back in RideDOT.com!